We present the screenplay of a physics show on particle physics, by the Physikshow of Bonn University. The show is addressed at non-physicists aged 14+ and communicates basic concepts of particle physics including the discovery of the Higgs boson. A quark is an elementary particle and a fundamental constituent of matter. They combine to form hadrons, the most stable of which are protons and neutrons, the components of atomic nuclei. Quarks are never directly observed or found in isolation. Hadronic Matter e-book, from the table of contents: An overview; Quarks; Hadrons; Baryons; Mesons; Nuclei; Flavour; Weak interaction; Flavour tagging; Related topics; Selected biographies; Selected facilities and experiments; and more. 'Dark Matter and Other Elementary Particles' develops a spatial model of the elementary particles (e.g., proton, neutron, electron, quarks, nuclides, and mesons) for particle physics much as the 'ball and stick' model provides to chemistry. The angular momentum controversy: What's it all about and does it matter? The general question, crucial to the internal structure of nucleon, of how to split the total angular momentum of a photon or gluon into spin and orbital contributions is one of the most important and interesting challenges faced by gauge theories. This is a handbook, or an extended glossary, written in encyclopedic format, covering subjects around particle detectors, the underlying physics, and the analysis of their data. It is both introduction for newcomers and reference for physicists. Content: Kinematics; Scattering theory; Thermodynamics of strongly interacting matter; Transport in theory and practice; Chiral symmetry in vacuum and at finite density; The properties of hadrons in dense / hot matter and possible signatures. These lecture notes have been written for a short introductory course on universality and renormalization group techniques given at the VIII Modave School in Mathematical Physics, intended for PhD students and researchers new to these topics. Structure functions are a measure of the partonic structure of hadrons. This is an overview on present structure function and related data, and on the techniques used to extract parton distribution functions to describe the structure of the proton. These proceedings contain lectures on quantum field theory, quantum chromodynamics, physics beyond the Standard Model, neutrino physics, flavour physics and CP violation, particle cosmology, high-energy astro-particle physics, and heavy-ion physics. From the table of contents: QED as an Abelian Gauge Theory; Non-Abelian Gauge Theories; Quantum Chromodynamics; Spontaneous Symmetry Breaking; The Standard Model with one Family; Additional Generations; Neutrinos; Supersymmetry. Seesaw-type and low-scale models of neutrino masses are reviewed, along with the corresponding structure of the lepton mixing matrix. The status of neutrino oscillation parameters as of June 2006 is given, including recent fluxes. Designed to acquaint students of particle physics with techniques applicable to all simple Lie algebras, this text is especially suited to the study of grand unification theories. Subjects include simple roots and the Cartan matrix, and more. Introductory lectures (delivered at the VI Mexican School of Particles and Fields) on heavy quarks and heavy quark effective field theory. Applications to inclusive semileptonic decays and to interactions with light mesons are covered in detail. These lectures describe some aspects of the physics of massive neutrinos. 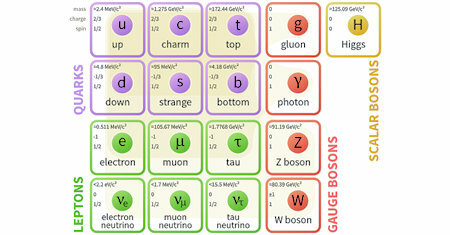 After a brief introduction of neutrinos in the Standard Model, the author discusses possible patterns for their masses. A discussion of Dirac and Majorana masses is included. This is an introductory text, it includes material which overlaps with particle physics, including a number of interesting models as well as material on identical particles. The ideas of quantum mechanics are introduced via Process Diagrams. This is a preliminary draft of lecture notes for a (500 level) course in elementary particles. From the table of contents: General Principles; Symmetries and Invariants; QED; Hard Scattering Processes; Precision Electroweak Physics. The Electromagnetic Interaction; The Weak Interaction; Strangeness; Quark Mixing; Quantum Chromodynamics; Hadron Spectroscopy; High Energy Scattering; The Electro-weak Interaction; Spontaneous Symmetry Breaking, the Higgs Scalar; etc. An introduction to the relevant mathematical and physical ideas that form the foundation of Particle Physics, including Group Theory, Relativistic Quantum Mechanics, Quantum Field Theory and Interactions, Abelian and Non-Abelian Gauge Theory, etc. We begin with a recapitulation of General Relativity, and the Standard Model of Cosmology. This is followed by lectures on inflation, density perturbations, study of hot and cold relics decoupled from the remaining constituents, and baryon asymmetry.